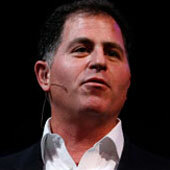 Michael Dell is returning; reshaping the industry? As we have seen today across multiple news reports Michael Dell is returning to the company and is in charge again of the troubled computer company he founded 23 years ago. After a two-year absence, Michael Dell is back as CEO of the PC maker he founded in 1984. Why troubled? Here are some facts as we know them explaining the situation behind Dell, Incorporated. In August 2006 his company ordered the recall of 4.2 million batteries. Dell launched an internal investigation into accounting practices, which uncovered padding of profits by midlevel managers; after the SEC announced its own investigation the company restated its books to erase more than $92 million in net income. In late January 2007 Dell booted Kevin Rollins, who was the chief executive since 2004, and James Schneider, the company’s chief financial officer. More startling, perhaps, was what he told his 82,000 employees: “The direct model has been a revolution but is not a religion.” It amounted to a repudiation of the gospel Dell himself wrote years ago, a business built on dealing directly with customers via the phone and Dell.com — brashly cutting out all retailers and wholesale dealers. For years the model worked brilliantly. Since going public in 1988 Dell has seen sales, net profit and share price all climb at compound annual rates between 28% and 33%. The company is also overhauling customer service division after struggling with complaints. Also lowered PC prices, dropped Intel-only policy. How Dell appears on the Forbes Global 2000: Sales Rank: 90; Profits Rank: 201; Assets Rank: 603 and Market Value: 142. In less than ten months Michael Dell has made many changes, some of them drmatic, focusing on flashier products and marketing, new Web sites to handle customer complaints and ideas and a bigger push to sell value-added services. During that short timeframe the company has managed even to achieve a handful of interesting acquisitions. Nonetheless Dell is slimming down, starting to cut 10% of its workforce on every level, a move that could save $750 million a year, says Christopher Whitmore, a tech analyst at Deutsche Bank. On the other side Dell has attracted a number of high profile names as executives. Mark Jarvis, the former marketing chief at Oracle. Steven Schuckenbrock, former president of EDS. Michael Cannon who was president of components maker Solectron. The biggest step however seems to be the Dell’s push to move into the retain space by putting products in 10,000 outlets like Wal-Mart, Staples and chains in Japan, China, Russia and the U.K. In other news Hypermarket chain Carrefour said it will sell Dell’s consumer PCs through its stores in France, Spain and Belgium beginning next year. Dell chose Carrefour because it is the world’s second largest supermarket chain, after Wal-Mart, and is present in numerous European countries. Carrefour also has operations in Latin America and China, which would be useful if Dell ever wanted to extend the relationship there. Dell is also in a virtual war with Apple CEO Steve Jobs starting when Jobs first criticized Dell for making “un-innovative beige boxes”. On October 6, 1997, when Dell was asked what he would do if he owned then-troubled Apple Computer, he said “I’d shut it down and give the money back to the shareholders.” Dell would regret these words after Jobs returned as Apple CEO in 1998. By early 2006 Apple was worth more (based on market valuation) than Dell. By October 2007 Apple was worth more than twice Dell’s value (AAPL:$160B – DELL:$62B). Dell resumed the CEO duties (replacing Kevin Rollins) at his troubled company in January 2007, and market value increased 11% in 9 months. During that same time Jobs’ Apple increased its market value 92%. Michael Dell said in late January of 2007 that his company would be worth more than Apple by the end of the year. What’s intersting here to pay attention to is the fact that since Dell returned and replaced Rollins the company’s market value increased 11% in 9 months. As of 2007, Forbes estimates Michael Dell’s net worth at $15.8 billion, making him the 30th richest person in the world and the 9th richest American. Dell currently resides in Austin, Texas with his wife, Susan, and their four children. Dell also owns one of the most expensive houses built in Texas. He is also rumored to be buyer in International Paper’s recent sale of 900,000 acres of timberland. Here are some Videos form the Dell Vlog account on YouTube which highlights some of the transformations takign place at Dell, Inc.